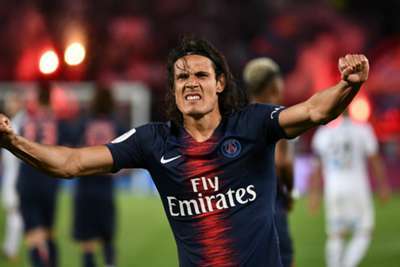 Julian Draxler, Edinson Cavani, Angel Di Maria and Moussa Diaby were all on target as Paris Saint-Germain continued their strong start to the season with a routine 4-0 Ligue 1 win at home to Saint-Etienne. Neymar was rested ahead of Tuesday's Champions League trip to Liverpool while Kylian Mbappe was serving the first game of a three-match ban after his red card against Nimes last time out. Saint-Etienne wasted a host of early chances in Friday's meeting at the Parc des Princes and Julian Draxler's terrific header earned the Ligue 1 champions a 22nd-minute advantage. Cavani converted a second-half penalty he won himself with Di Maria adding gloss to the scoreline with a thumping strike before teenager Diaby opened his Ligue 1 account in the 84th minute. Thomas Tuchel has now won his first six competitive games in charge of PSG, breaking Carlo Ancelotti's club record. Lois Diony missed a brilliant 13th-minute chance when picked out by Yannis Salibur's low right-wing cross, Loic Perrin then sending a free header wide from Wahbi Khazri's corner. But after Yann M'Vila slotted a shot just wide, PSG took the lead against the run of play. Adrien Rabiot battled to win the ball in the centre circle and Marco Verratti's lofted pass into the box was nodded into the air by Draxler, who improvised to head a fine finish over Stephane Ruffier. And PSG doubled their lead just six minutes after the restart, Cavani scoring from the penalty spot for his 12th career goal against Saint-Etienne. A clumsy challenge from Saint-Etienne captain Perrin brought the striker down, with Cavani sending Ruffier the wrong way from 12 yards. The offside flag ruled out Timothee Kolodziejczak's own goal but PSG added a 76th-minute third when Di Maria lashed in from close range, substitute Diaby then making the most of Cavani's mishit to wrap up the scoring. The Ligue 1 title is the minimum expectation for Tuchel and the German could hardly have made a better start with five wins all by at least two-goal margin, as well as a thrashing of Monaco in the Trophee des Champions. PSG are already six points clear in top spot and no serious challengers for their crown are emerging. But the real test this season will be in Europe and PSG's progress under Tuchel will get a stern examination at Anfield. The absence of Neymar and Mbappe meant Tuchel gave Draxler a first Ligue 1 start of 2018-19 and he made the most of it with the opening goal. Opportunities were scarce for the playmaker last term but the speed of thought that enabled him to score an excellent header could be useful to PSG. PSG appeared to have one eye on Liverpool in the opening exchanges and Diony should have punished their slack defending. But the striker somehow failed to convert Salibur's centre from six yards when it looked easier to give the visitors a surprise lead. The Champions League is back on Tuesday and PSG have a tough assignment first up in Group C, travelling to last term's beaten finalists, before heading to Rennes next weekend. Saint-Etienne host Caen a week on Saturday.